TL:DR: Singapore is striving to transform itself into a Smart Nation, and sensors are an integral part of that vision. Everything from aerial drones and autonomous wheelchairs are getting upgraded with onboard computing capabilities and sensors. GovTech’s Mr Quek Yang Boon shared about these inventions and more at the National Engineer’s Day 2018. Were it not for the ingenuity of ancient inventors, the world as we know it today would be very different. From the steam engine to the printing press, technological advances drive social and economic progress, changing the way entire nations function. The pace of innovation is even faster today, and the outputs of science and engineering are having a deep impact all over the world. Singapore is no exception to the global trend of leveraging technology to improve the lives of citizens, and its transformation into a Smart Nation is well underway. 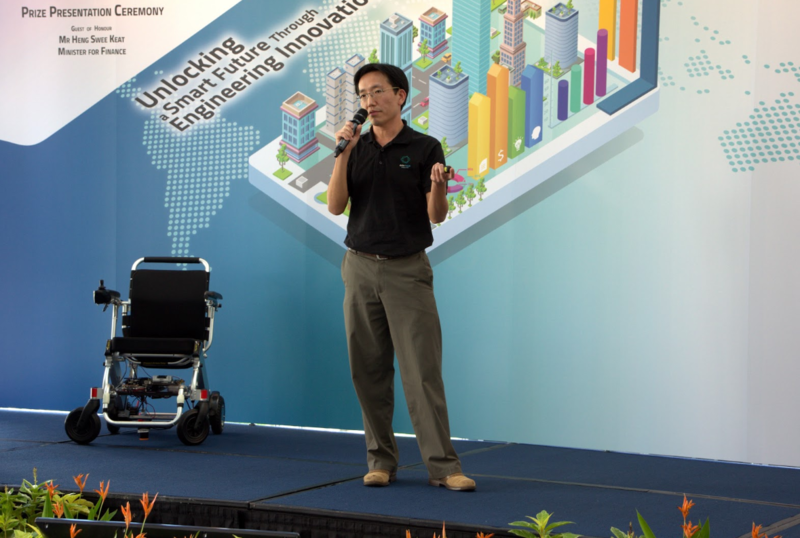 On 27 July 2018—National Engineers Day—Mr Quek Yang Boon, director of the Sensors and Internet of Things (IoT) Capability Centre at the Government Technology Agency of Singapore (GovTech), gave audiences a glimpse of some of the Smart Nation projects that are being carried out in the city state. “We often talk about dreams taking flight, and in this case, it has,” he said, highlighting SingPost Alpha, a drone that has been used to autonomously deliver a letter to Pulau Ubin, an island off the northeast coast of Singapore. Simple and compact as the drone may appear, it comes equipped with a host of technologies to ensure that it arrives at its destination safely, and that its cargo ends up in the hands of the intended recipient. A GPS receiver helps the drone find its own location, and an onboard flight computer charts out flight paths. The drone also has a laser range finder to avoid physical obstacles (and birds), while mounted cameras and radios allow it to communicate with control stations and cargo recipients. Should there be severe turbulence or bad weather during flight, the drone will deploy a parachute to make a gentle landing. Mr Quek noted how inventions such as SingPost Alpha tap on the power of computing, sensors and IoT to reduce reliance on manpower. The regulation surrounding autonomous drone delivery still needs to be worked out, but the technology has been tested and proven to work. Having described sensors and IoT in flying gadgets, Mr Quek next highlighted how ground-based devices are also getting an upgrade. As if on cue, a motorised wheelchair rolled itself on stage. “This wheelchair has local navigation capabilities which allow it to go from point A to point B completely unmanned—there are no remote controls,” said Mr Quek. Like a stripped-down version of an autonomous car, the wheelchair has a powerful processor for mapping spaces and a surveying tool called LiDAR [Light Detection And Ranging] to help it avoid obstacles, he added. With this technology, a single care provider can attend to multiple disabled or elderly persons at once. As Singapore’s population ages, building these capacities are becoming a priority. But making individual devices smart only goes so far in terms of impact to society. To truly become a Smart Nation, what’s needed is a network of connected devices to understand the environment and analyse citizen behaviour, allowing for evidence-based decision making. In Singapore, such a network is currently being developed—the Smart Nation Sensor Platform. It can be extremely costly to build physical infrastructure from scratch to support an island-wide sensor platform. Hence, the Singapore government is looking to mount IoT-enabled devices on lamp posts, which are already available and widely distributed, said Mr Quek. Infographics: Just how smart lamp posts can get? These smart lamp posts would function as the ‘nerves’ of the city, collecting data and sending it back to the relevant agencies—the ‘brain’ of the city—for analyses. Additionally, smart lamp posts can enable differential GPS, which greatly enhances the accuracy of location tracking. Typical GPS can drift by three to ten meters in urban environments due to interference from the weather, or satellite signals bouncing around high-rise buildings before reaching the target. Smart lamp posts could therefore serve as fixed, ground-based reference points to locate the position of an object, person or vehicle with an error margin of less than a meter. 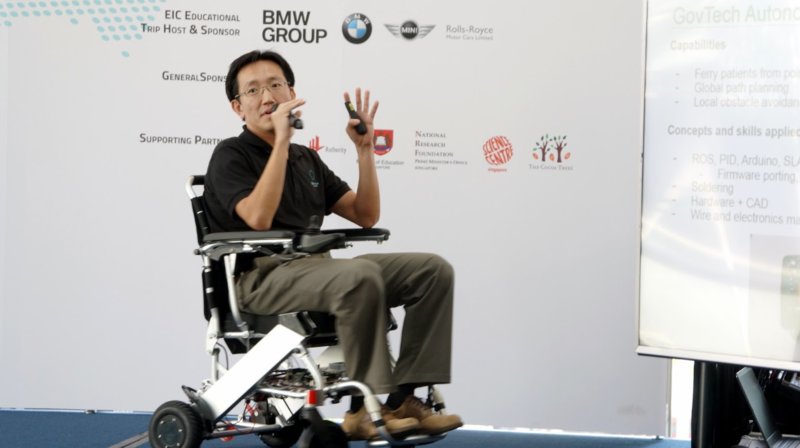 Mr Quek noted that such high-resolution GPS tracking is critical for autonomous vehicles—or the autonomous wheelchair, for that matter—to navigate. Therefore, the SNSP is not just meant for the present—it is also paving the way for the future, when driverless cars and trucks may ply Singapore’s roads. “By knowing the precise location of a vehicle or robot, you can have precise control over it, and that’s important,” he concluded.